When I shared a smoke with a freelance journalist that had been forced into retirement by the intimidation and harassment he felt under the hands of Ormoc City Mayor Richard “Goma” Gomez, the old saying “all that glitters is not gold” came to mind. 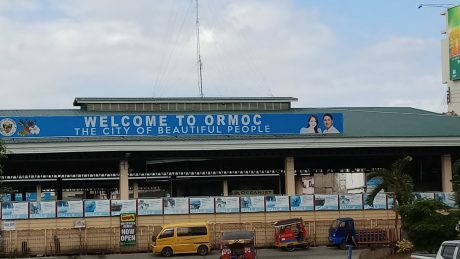 While the so-called “City of Beautiful People” seems to have recovered from the 6.5 earthquake in August 2017 and typhoon Haiyan (Yolanda) which pummeled the city in November 2013, the old journalist’s stories about how the city’s coffers were bleeding from mismanagement and corruption seem to show Ormoc’s deeper wounds have yet to heal. Beneath the substrate of freshly painted buildings and recently cemented roads lie the stories of a city whose current leadership may be sending it hurtling towards imminent disaster even as its hundreds of thousands of residents welcome the fiesta vibe of the upcoming local elections with copious amounts of tuba. The glossy tarps put up by Ormoc City Mayor Richard “Goma” Gomez and Congresswoman Lucy Torres-Gomez all over the lowland city in Leyte lie the bleeding hands and feet of citizenry subjected to the “discipline” of their elected overlords as well as the muffled voices of those left behind by people that had been “run out of town” for fighting city hall. Just weeks after assuming his post as Mayor, Gomez was said to have gathered all of the city government’s employees and told them how very lucky they were to have him as their city’s elected leader. From the way this story was told to me, it wouldn’t take a stretch of one’s imagination to figure he had said that his being mayor of Ormoc was like all the citizens there won the lotto jackpot or the top prize of the grand cockpit derby. His actions in the coming months would reveal his ineptitude at backing his promises. For instance, one of Gomez’ first acts was to have Ormoc’s old city hall prettified with three dancing fountains to the tune of P10,300,000. Nothing wrong with that, except that the project broke ground and was completed without the required public bidding. His contractor buddies at Industron would have made off with the loot had not the city’s treasurer found a way to stop payment for the obviously corrupt project. Since then, Gomez subjected the city treasurer to public humiliation, out right threats, and trumped up accusations that eventually drove the city government official out of Ormoc. With the city treasurer out of the way, Gomez would be free to be similarly “creative” with how to spend the city’s money. But as far as disaster is concerned, 2017 was particularly eye opening for the people of Ormoc when Mayor Gomez blundered and failed to adequately respond to the disasters that hit his city. Mayor Gomez’ failure was so terrible that the Commission on Audit had to flag him. COA also found only 37 percent or P60,286,148.08 of the total P161,731,829.65 trust fund was used because of the “absence of review and monitoring” mechanisms, as disclosed by an officer in an interview. In short, the city’s disaster funds might as well have been converted into a pork barrel fund. Where it went from there is unclear to me at this point and from what I gather, it won’t be far from being disastrous in the months following this year’s election. 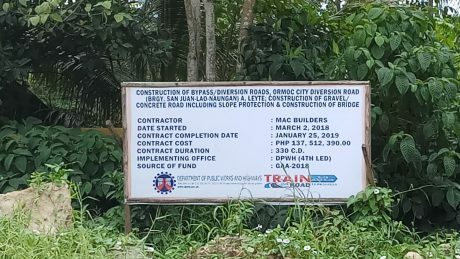 One ominous sign that things won’t go well for Ormoc City once the 2019 typhoon season comes in is the construction of a by-pass diversion “gravel/concrete” road in the Barangays of San Juan, Lao, and Naungan OVER A LIVING MANGROVE FOREST to the tune of P137 Million. Even more amazing is that DENR and DPWH undertook the project! The project is supposed to be finished by January 25 this year, but it seems far from being done when I visited the road. The pick up truck that drove me there had to drive in low gear because its wheels were slipping and sinking in the soft clay that composed most of the road. 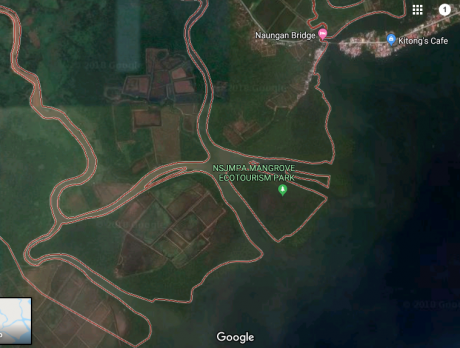 The P137 Million by pass diversion road crossing a living mangrove park in Ormoc City, Leyte actually creates a hazard for the thousands of residents in three barangays. 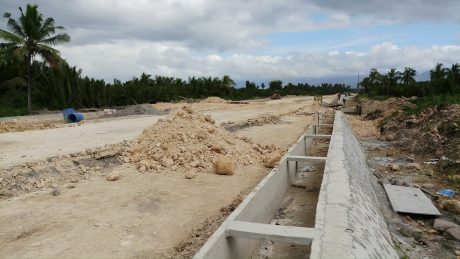 It boggles the mind how the DENR and the DPWH could have said yes to this project when it puts thousands of Ormoc City residents in DANGER! How can a DIRT AND GRAVEL ROAD cost P137 Million?? From three fountains worth P10,000,000 to a sure disaster road project build over a mangrove forest, what other feats of stupidity will Ormoc City Mayor Richard “Goma” Gomez come up with? Sigh! The people of Ormoc City are INDEED lucky in a really bad way. 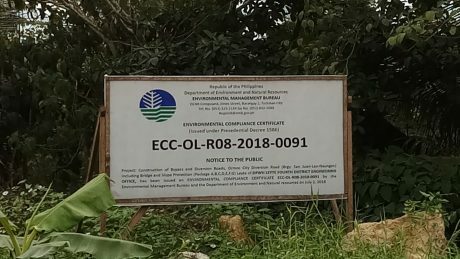 The DENR and DPWH were complicit in the bypass project for the same reason they’re complicit in similar scams all over the country: because they can. There’s an almost identical project planned for my locale. I doubt anything will ever actually materialize as a functioning road, but in the meantime, a lot of logging will be done, a lot of concrete will be poured, and a lot of taxes will disappear into thin air. The plebs voted for Gomez, and they probably did so because he promised to steal and connive on their behalf. While the average Filipino likes to believe he’s as pure as the driven snow and Corruption only happens in high office, the uncomfortable truth is that the turds float up from the bottom. What is the short-cut way to be in the elite class? By way of corruption. This is the price that we pay for, for wanting to become an elite. The only thing that I can thought of why people are obsessed to become an elite is they want to be treated like a god. But since human is the opposite of God, humans don’t turn into a god they turn into monster. Do we have an operating Commission on Audit (COA) ? Unless, we prosecute and jail these politician crooks; there will be more and more corruption. It is also the fault of the people of Leyte, on why they allow these corruption to happen. Maybe, they are all intimidated by the crook, Gomez. This is what happen when we have husband and wife, and political family dynasty rule a province. What is the national government doing on this corruption ? You still believe these journalists? They’re also under some politicians payroll. It is just a matter of who pays them.